The field of Health Care Management is rapidly growing as the need for health care professionals with management and business experience expands. Health care management and health care administration programs train professionals to analyze and create policy, manage hospitals and health care networks, and direct the operation of hospitals, health systems and other types of organizations. Work settings are diverse with graduates working in positions within technology firms, insurance companies, hospitals, and long term care facilities. Starting pay can average over $65,000/year and, according to Forbes magazine, the field is expanding as demand increases. 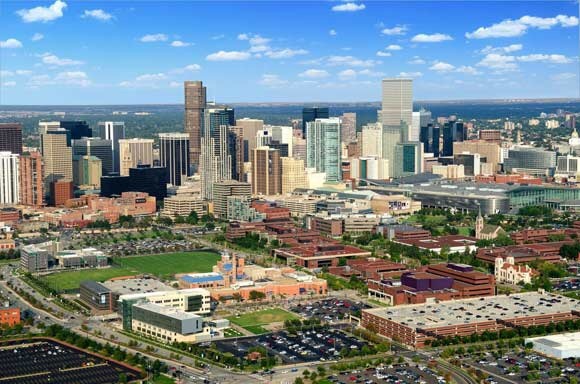 The list below highlights 25 great healthcare management programs in urban/metro areas. These regions can provide a provide range of internship and employment opportunities for individuals pursing careers in the field. We started our review by considering schools which have current accreditation with CAHME (Commission on Accreditation Healthcare Management Education). Schools in urban or metro areas were then selected for ranking. Where there are ties, the school with the lower tuition is favored. The point-based ranking system is shown below, and the list of programs is presented in ascending order of points awarded. Information is drawn from the program’s website. 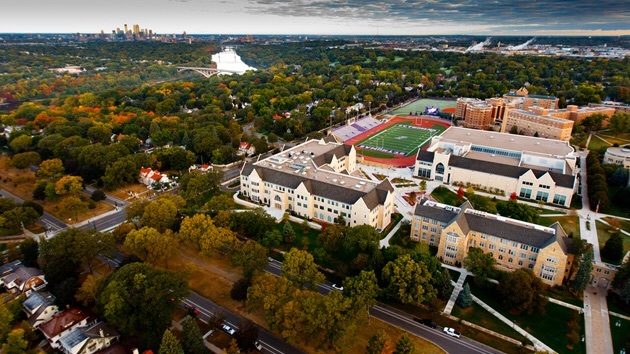 The University of St. Thomas is located in Minneapolis, Minnesota — the 14th largest metropolitan area in the United States. The Heath Care UST MBA program is a 21-month hybrid program for working professionals. Health Care UST MBA is one of only 14 MBA programs in the country accredited by both the AACSB and the CAHME. Students spend time as a cohort and complete courses both online and during campus residencies. Students also participate in a three-day seminar in Washington DC meeting with national leaders in the field. The school claims that 100% of graduates are employed either during the program or shortly after graduation. 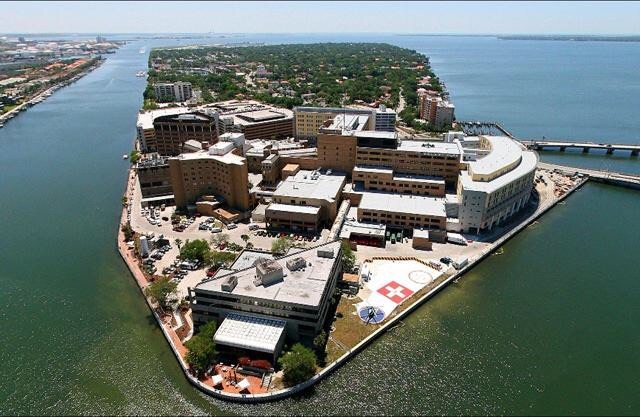 The University of South Florida offers several programs in the area of health care management including a Masters of Health Care Administration. Students can complete the program by taking 58 credit hours. Field study is required prior to graduation to gain administrative experience. The program boasts a 90% completion rate (a three-year average), along with a 90% employment rate for graduates. The Health Care Administration program at the University of North Texas is a 60-credit-hour program that can be completed either full time or part time. The program is designed for the seasoned executive as well as those new to the field. Students complete a 500-hour unpaid internship during the last phase of study. Students may be considered for a fellowship after graduation. The University of Oklahoma is located in the state capital and largest city in the state. The MHA program is a 60-credit-hour program that can be completed either full time or part time. Full-time study takes two years to complete, and entails an internship between the 1st and 2nd year of the program. Most graduates are placed in a fellowship giving them additional administrative experience. The program boasts a 95% graduation rate, and it also claims that 90% of graduates are placed in a fellowship or obtain full time employment within three months of graduation. 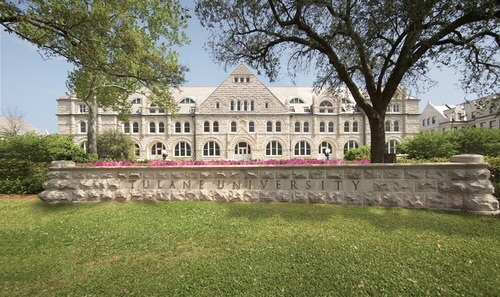 Tulane University is the oldest school of public health in the country. Tulane currently offers a variety of programs to meet the needs of those looking to continue their education in the field of Health Administration. Students can pursue a Master of Health Administration either full time or part time and may enter the program in any semester. An integrated residency experience is a highlight of the program. Students interested in dual degrees can pursue the Joint Business MBA/MHA or the Juris Doctor/MHA. 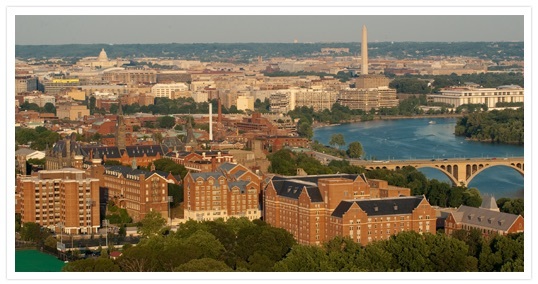 George Washington University offers an Executive Master of Health Administration. The program features online learning exercises and live, face-to-face weekly class sessions. Students are required to make periodic in person visits to enhance collaboration. Courses are offered in eight 10-week learning modules. An applied research project is completed during the last cohort prior to graduation. 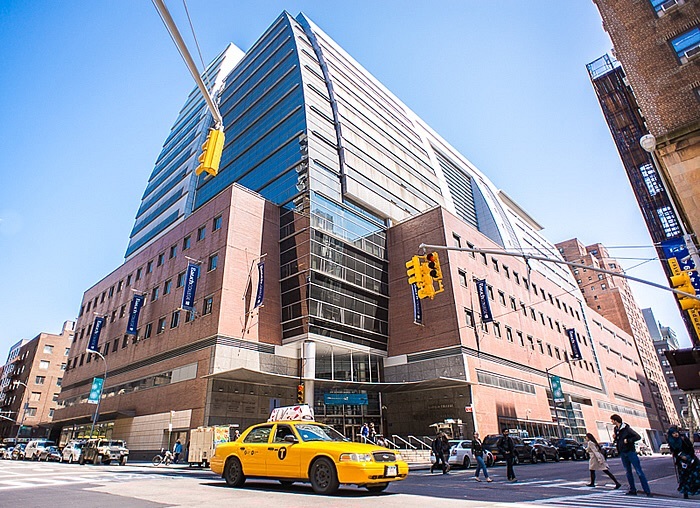 The Executive MBA in Healthcare Administration program at Baruch College in New York City claims to be the only program of its kind in the New York metropolitan area. Students complete 57 credits of coursework and can complete in approximately three years. The program is part time, and students attend evening courses. Currently the program boasts a 93% graduation rate. The Department of Health Management and Policy offers several program options for those interested healthcare management. A Masters of Health Services Administration, Masters of Public Health, Masters of Science in Health Services Research, and a Doctor of Philosophy are available to students looking to continue their education. An Executive Master’s Program combines on-campus and distance learning. Students in the Masters of Health Services Administration can expect to complete in about 2 years and participate in a required internship during the summer between the first and second year. 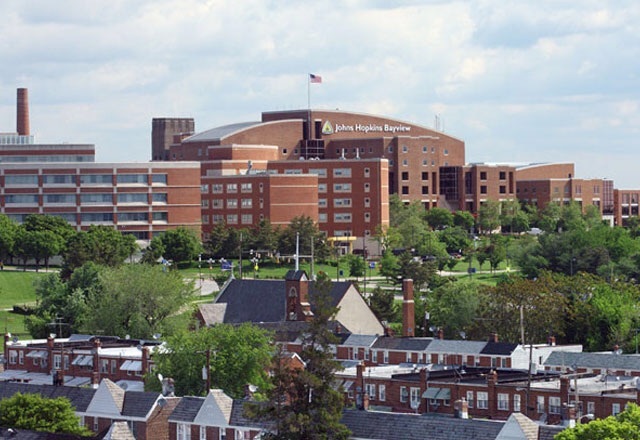 Cincinnati, Ohio is home to Xavier University which offers a masters degree in Health Services Administration. Full-time students enrolled in the program receive a paid, 8-12 month administrative residency as part of the curriculum. Full-time students can complete four semesters of study (64 credit hours), and part-time students can complete in 9 semesters. Xavier also offers a join MBA/MHSA degree that can be completed either part time or full time. 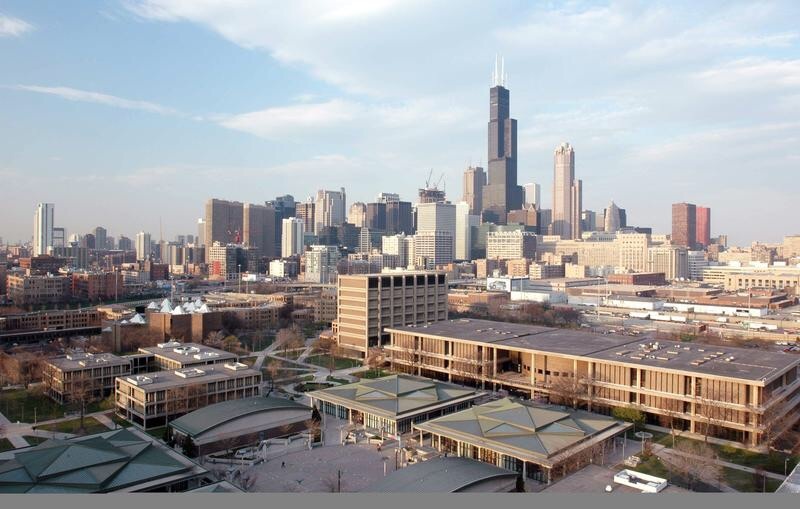 Rush University is located in the bustling, urban city of Chicago and is consistently ranked as a top 10 program in the field of healthcare management. The Health Systems Management program utilizes a Practitioner-Teacher model approach where faculty have dual roles as both practitioners in the field and educators. Program admission is competitive and only 47% of applicants are accepted. Students are guaranteed to receive paid hands on work experience starting in their first year of the program. UCLA offers two program options leading to a master’s degree in Health Policy and Management. The traditional two-year option allows students to complete 16 courses and a one-year graduate residence. An accelerated one-year option is available to those who already possess a doctoral degree and experience in the field. This option requires students to complete 12 courses. Virginia Commonwealth University is located in the capitol of Virginia. They currently offer two programs to meet the needs to those looking to advance their career in healthcare management. The MHA degree program is an industry-specific MBA program designed to be completed on a full-time basis. The program can be completed in three years, with the third year being a 12-month paid administrative residency. The Masters of Science in Health Administration (MSHA) program is a flexible degree program that can be completed part time or full time, with a blend of on-campus and off-campus requirements. The Graduate School of Public Health offers a Masters of Public Health in Health Management and Policy. Students are able to complete the program on a full-time or part-time basis, but must complete within 7 years. Fifty-six units of credits are required for graduation and students must complete a thesis, management project or comprehensive exam. The program offers supervised field placements to gain experience. According to program information, 100% of students completing the post-graduation survey reported finding employment in the field upon graduation from this program. 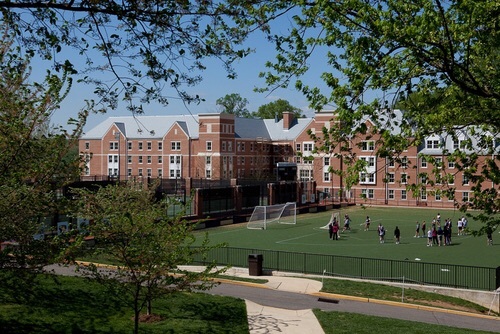 Georgetown University offers a Masters in Health Systems Administration. The program provides opportunities for internships, assistanceships, and an administrative residency in the last semester of attendance. Both full-time and part-time students can take advantage of the Executive Mentorship program which is a 1:1 mentoring program where students work with an executive healthcare mentor in the field. An Executive Master’s program is available and involves student participation in three weeklong on-campus intensives, five 12-week online sessions, and one offsite intensive. Students in the Executive Master’s program can expect to finish in about two years. Columbia University in New York provides a solid education for students wanting to study in New York City. The Healthcare Administration program is delivered in full-time, part-time and executive formats. Full-time students complete a summer practicum and can expect to graduate in about 2 years. Part-time students can take advantage of an evening cohort model and complete in approximately 28 months. The executive format allows students to attend class for one long weekend each month over 2 years. 95% of full-time students reported being employed within 3 months of graduation. The Masters in Healthcare Management from John Hopkins University has both part-time and full-time options to accommodate those new to the industry and seasoned professionals. The full-time option uses a cohort format and can be completed in approximately one year. The part-time option is available to those with more than two years of experience and courses are available in the evenings and on Saturdays. Students can also pursue their MBA with a concentration in Health Care Management on a full-time basis (Global MBA) or part-time basis (Flexible MBA). The University of Pittsburg features a Master of Health Administration in Health Policy and Management degree program. Students complete 60 credit hours of study and complete an on-site management residency as well as an advanced thesis research effort. Those interested in an executive program can benefit from the Executive MHA which features blended online coursework and periodic classroom sessions. The School of Public Health at the University of Illinois-Chicago offers both a Master of Healthcare in Administration (MHA) and a Clinical Executive Master of Healthcare Administration. Students in the MHA program can attend full or part time and complete a preceptorship prior to graduation. The preceptorship allows students to learn from professionals in the field. A capstone project is required for graduation. The University of Kansas Medical Center provides a flexible Health Services and Administration program to meet the diverse needs of those interested in continuing their education in an area of health care management. Students can complete the 56-credit program either full time or part time, and courses are offered in the late afternoons and evenings to accommodate working professionals. An internship is required to gain practical experience. Joint degrees such as the JD-MHSA, MS in Nursing-MHSA and an MD-MHSA are available. The Graduate School of Business Administration offers both an MBA (51 semester hours) and an MS degree (33 semester hours) in Health Administration. Coursework is delivered during the evenings and online. A mentorship program is available for those seeking additional 1:1 assistance. Student can complete an administrative residency, but this is not required as part of the program. UCD students benefit from small class sizes and greater faculty interaction. 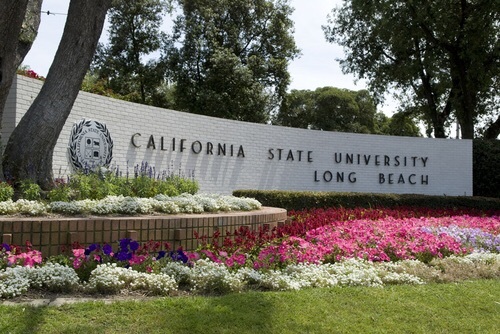 California State University-Long Beach offers a Masters degree in Healthcare Administration. Students are able to take advantage of both full-time and part-time program options which include 45 units of coursework (13 core courses and 2 electives). Courses are offered during the evening hours Monday through Thursday. The Accelerated Program combines online education with face-to-face weekend sessions to allow participants to move through the program and integrate their learning experience with their professional work experience. 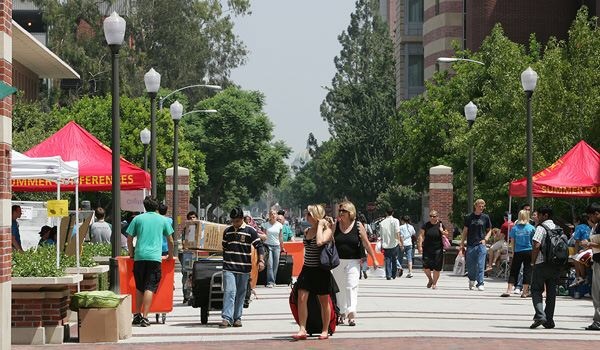 The University of Southern California offers both a Master of Health Administration (MHA) and a joint MHA/MSG (Master of Science in Gerontology) degree. The MHA can be completed either full time or part time, and students must complete a 1,000-hour administrative residency. Courses are offered in the evening or in an intensive format. 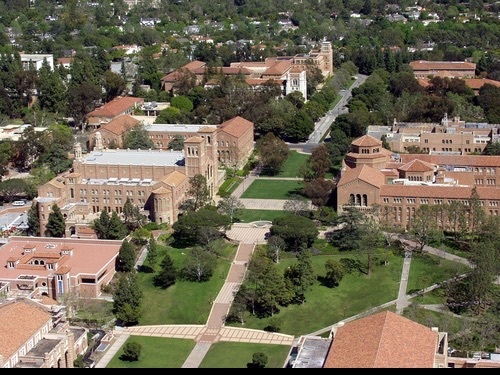 USC is located in the most diverse, multi-ethnic metropolitan area in the United States. 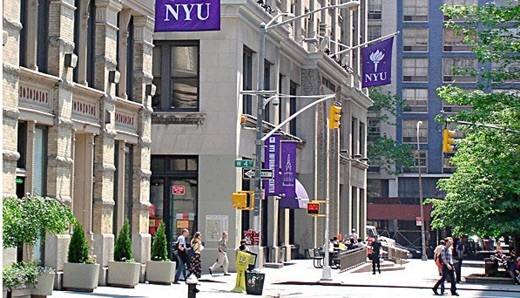 New York University offers a Master of Public Administration in Health Policy and Management in addition to several joint degrees including a JD-MPA, MBA-MPA, MD-MPA, MPH in Global Health Leadership-MPA and MSW-Executive MPA. Students can earn their degree attending school full time or part time taking evening classes. Students complete a capstone project prior to graduation. A Professional Experience Requirement of at least two years of full-time work experience is required to fulfill graduation requirements. Students are able to obtain employment in a program-relevant job role or internship while pursuing requirement. 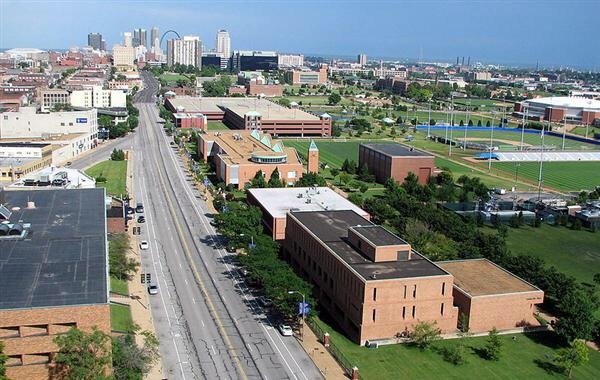 St. Louis, Missouri is home to the Master of Health Administration Program at St. Louis University. Students can complete the 60-credit-hour program full time or in an executive format utilizing distance learning (online, blended program). Students in the full-time on-campus program complete a summer internship between their first and second year. There are also two combined degree options including a MHA with a JD and an MHA with an MBA. The University of Utah offers several dual degree programs for those interested in a Masters of Health Administration. Students can select a joint MHA/MPA program which can be completed during evening hours or in an executive weekend format. For those looking for a join MHA/MBA program, the University of Utah offers a part-time and full-time join program. Students can also choose the part-time or full time joint MHA/MPH degree program. Students in all joint programs get the chance to experience a 500 hour administrative internship and many graduates are placed in yearlong fellowships. You are welcome to promote this article using the award badge found here (high resolution version).